Today was the perfect day to finish up my 2009 good luck leaf collecting. The Indian Summer temperatures and opportunities for two walks with two old friends was too fine a combination to pass up. With a gentle 63-degree breeze making the chasing and catching more interesting, today was a nice way to finish this year's effort. I don't remember when I first started catching falling leaves each autumn for good luck, but I've been doing it since I was a youngster and caught oak leaves on the way home from school. The acorns on the sidewalk tripped me up then. Now it is rocks and dips on the trails that I have to watch out for as I dash and dart to catch the maple, beech, or cherry leaves before they touch the ground. 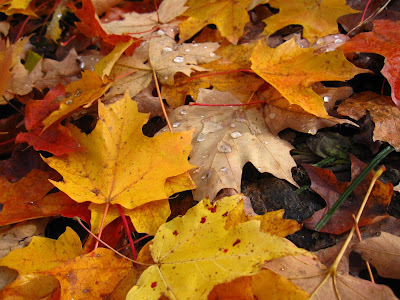 English folklore of the late 1880s promises twelve consecutive months of good luck and happiness for those who catch 12 leaves in the month of October. Another proverb advises it is lucky to catch a falling leaf before it reaches the ground because you will have a happy day or month for each leaf caught. And still another promises a wish comes true for each leaf caught. In order to cover all bases, I make it a practice to chase and catch as many leaves as I can, sometimes falling, but always making wishes. I am not calling the good luck collecting season over yet. There are still some leaves on the trees and I always have more wishes.